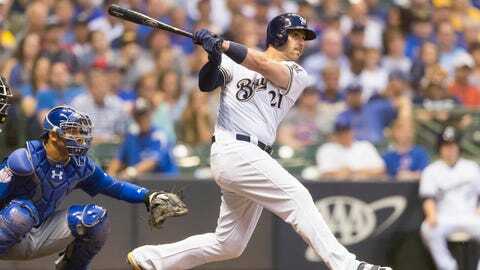 Travis Shaw is having another good season for the Milwaukee Brewers. The third baseman leads the team in doubles (17), home runs (14) and RBI (43) while posting a slash line of .249/.345/.502. The left-handed Shaw has really mashed right-handed pitchers, though, batting .266/.368/.590 with 14 doubles, 14 home runs and 39 RBI, with just three more strikeouts (32) than walks (29). In the National League, against right-handed pitchers he ranks first in RBI and extra-base hits, is tied for first in home runs (with Washington’s Bryce Harper), second in slugging percentage (behind Los Angeles’ Joc Pederson) and fifth in OPA (.958). That’s good news for this weekend. Milwaukee’s opponent beginning Friday night is Philadelphia. The Phillies‘ scheduled starters for the three-game series are Jake Arrieta, Zach Eflin and Aaron Nola — all right-handers. — Since 2016, the Brewers and Phillies have split their 16 matchups. Milwaukee is scoring 5.25 runs in that span; Philadelphia 5.13. — Philadelphia is 13-19 on the road this season, averaging just 3.63 runs per game while batting .216 with a .646 OPS. — Both teams are good in one-run games. The Brewers are 16-7 in such contests while the Phillies are 11-6. — Ryan Braun has a career 1.149 OPS vs. Philadelphia, the second-highest against the Phillies over the last 100 years. Only Vladimir Guerrero (1.204) is higher. — Brent Suter has thrown his fastball for a strike 70.2 percent of the time, which ranks fifth in MLB.